Einstein once said: "Imagination is more important than knowledge." Please use your imagination when you consider and evaluate the following suggestions and information that clearly reveal some of the countless benefits that could be realized by everyone associated with the first of its kind, state of the art, all purpose, fully maintained and managed, no kill deer park sanctuary in the United States. I hope you will agree that the *FIRST OF ITS KIND* properly located no kill deer park would not only be a *MAJOR TOURIST ATTRACTION* and a HUGE FINANCIAL SUCCESS it would also establish a precedent for governors in many other states to emulate as well as government officials from many other countries to seriously consider. 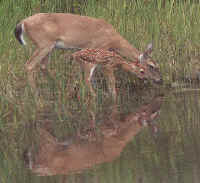 Special deer park sanctuaries where anyone including hunters could and would visit and enjoy with their families. Special no kill sanctuaries where all of the deer will live a full and safe life in peace and harmony with the earth. Governor Granholm , I am associated with several experts that would be pleased to provide a complete outline of recommendations and procedures needed to help *build and finance* the first all purpose no kill deer park in the United States. The first publication below reveals why the first of its kind no kill deer park sanctuary in the United States would very likely be a major tourist attraction visited and appreciated by people from all over the world, especially children!! The second publication reveals how profitable a state of the art no kill deer park could be and reveals why it has been so difficult to get the attention of government officials in order to impress them about the real benefits to the economy, the benefits to the deer, and the future prospects and countless residual benefits from no kill deer parks opening throughout the United States. The third publication reveals that about 5 per cent of the U.S. population are hunters and that there are many aspects of hunting that are not so wonderful, especially for very young children to be exposed too and experience. Governor Granholm, why not provide thousands of people that have never hunted, and will never hunt, with the opportunity to visit and enjoy a wonderful *first of its kind* no kill deer park sanctuary in Michigan? Governor Granholm, I will continue to send you related information with the hope you can persuade the right people that *the first* no kill deer park sanctuary in the United States is well worth considering in one of several appropriate locations in Michigan!! Thank you for any consideration as well as your help and your advise.